We were caught in a January Polar Vortex with temperatures in the minus range and I needed to drive Natalie to work since her car wouldn’t start. I knew I had part of a loaf of multigrain bread left for a quick breakfast of toast and coffee. I went to slice the bread, but mold had beat me to it. Panic! I looked in the refrigerator and the closest thing I had to bread was a package of corn tortillas, but toasted tortillas wouldn’t cut it for breakfast. So. in a few minutes, this is what I came up with. Usually desperation cooking produces OK results, this one turned out superb, so it made the website. Unfortunately, my Spanish vocabulary is very limited. Dice the onions and jalapeno and fry in the oil until the start to brown. Beat the eggs with a whisk and add the black pepper to the mix. Add the eggs to the skillet and scramble and add 1/2 of the cheese to the mixture and remove from heat. Wrap the tortillas in a damp paper towel and microwave for 1-5 or 20 seconds. Line a small sheet pan with foil or parchment. Divide the eggs into four parts. Fill half of each tortilla with eggs and then fold over the other half of the tortilla. Put them on the sheet pan and hold it closed with a couple of toothpicks. Sprinkle the rest of the cheese over and put them under the broiler until the cheese melts and starts to brown. Put a layer of Arugula on each plate and then top with the filled tortillas. Remove the toothpicks and top with the salsa. Serve a small scoop of guacamole on the side. You can add whatever you want to the scrambled eggs depending on your preferences. If you don’t have guacamole, diced avocado with a squeeze of lemon or lime can be served on the side. Since I’ve been growing Tomatillos in the garden, I’ve been looking for new recipes to use them in. I found a couple interesting recipes on the web and adapted them to my own tastes and came up with this one. Grilling the Tomatillos, onions and peppers adds a delightful smokiness to the salsa, so you really need to make an effort to grill them. I made this recipe for our annual trip to the Vintage Illinois wine festival at Mattheissen state park and it disappeared quickly even with a lot of other food around, which let me know it was a hit. This is an interesting alternative to Guacamole, and a nice change when Tomatillos are in abundance. Halve and remove stem from the Tomatillos. Put the Tomatillos, onions and peppers in a bowl and sprinkle generously with salt, pepper, granulated garlic and olive oil, mix well to coat evenly. When the mixture has cooled a bit, puree it in a food processor along with the garlic and lime juice. Peel and seed the Avocados, and dice to about 1/2 inch cubes. Combine in a bowl with the Tomatillo puree. Add the chopped bunch of the cilantro to taste. Mix well, taste, and add salt as needed. 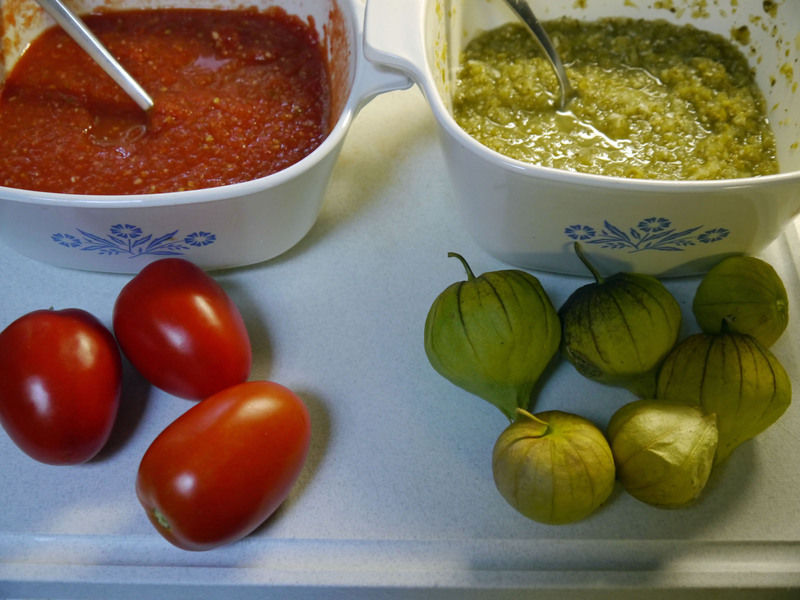 You may want to add some sugar depending on the tartness of the Tomatillos. *You could probably roast the vegetables in a 450 degree oven, but the grilling really adds a lot of flavor, so grill them if you can. **Usually the grilled Jalapenos don't add a lot of heat so I add hot peppers to get a bit of spice in the sauce. The red peppers also add some color and flavor to the salsa, so use sweet ones if you want the dip very mild.